In preparation for PAX in Melbourne this year, Trev (of Trev’s Workshop) and I have been plotting to build a showstopper. An entire combat box of the mighty B17 Flying Fortress, with a flight training school nearby sending green Luftwaffe pilots up in a desperate effort to stem the tide of Allied airpower. Its been a fun journey of acquiring B17‘s, tweaking rules to reduce admin (sooo many guns!) and creative thinking to incorporate altitude in the best way. Now Wings of Glory does have altitude rules. But it does not have rules to depict energy and momentum. So this is something I feel needs to be added. 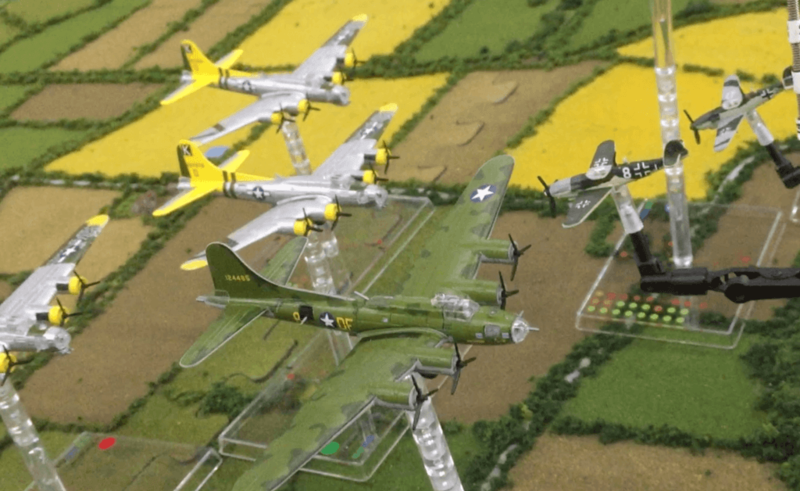 We’ve been testing these each time the B17 Flying Fortress comes out. Not for the their sake, but for the attacking 109k‘s. In designing these rules, I really wanted to capture the ‘feeling’ of diving through a large formation of bombers. If it was me, all rulesets would focus on this, abstracting whats necessary to take the player completely away from charts and right into their imagination facilitated only by the art and miniatures around them. Less is more. 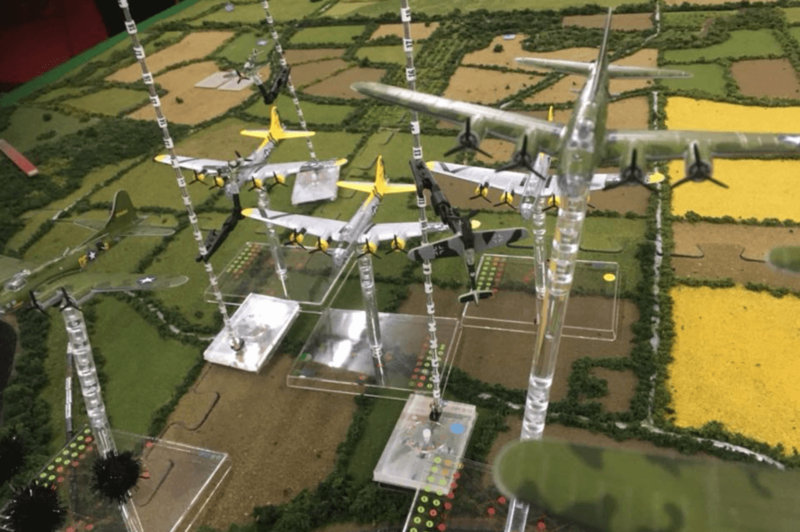 Now I am aware that the design team for Wings of Glory have put an extraordinary amount of work into the mathematical accuracy of the turn, climb and dive rates of each individual plane and in the horizontal dimension, its 2nd to none. I love it. The cards are so easy to teach to newcomers, and they completely do capture the ‘feeling’ like I have described above. But the preference for mathematical accuracy in the Wings of Glory altitude rules and the scaling to squash enough of that onto their small altitude stands leaves me feeling like something’s missing. The visual appearance of a game like this is of utmost importance to me. So if I was to be attacking a formation of 12 B17’s, I would NOT want to be doing it slowly from behind and level, but at high speed diving past the edge of the formation. I would want the game to allow me to display this too, leaving my imagination for any other details that take my fancy. Now a related project I am working on is some new flight stands that can support this idea of the ‘feel’ of diving through a formation of bombers. The Wings of Glory stands work fine for the bombers, but for the fighters, something more advanced is required. These stands in the photos I bought off eBay 5 years ago. I’ve been on a mission to design some new flight stands ever since I found Wings of Glory about 8 years ago and these captured beautifully where my thinking was at back then. My current design which exists almost completely in my head will have a similar look and feel but will support numerous mechanics we have not yet tested in a game. Could a blend of the Wings of Glory mathematics and the ‘feel’ of diving through a formation exist? Well, depending on how the play testing goes I believe yes. Personally Its all about the ‘feeling’ of attacking large formations over the ‘mathematics’ of true flight paths in the design of rules, but I still respect the need for it. If ever there was a place for abstracting elements of a game though, I feel that the vertical dimension in an aerial wargame is it. Wings of Glory has done a beautiful job of designing the horizontal dimension, I’m on a mission to solve the vertical. Watch this space!! Oh, and the B17’s won this mission, with 70% of the formation making it to the bomb run and 8 109k’s shot down!